Many people have speculated that Cryptocurrencies can go to $10k or higher. Recently, the Chinese government has stepped up policy to regulate and eliminate Crypto ICOs as a means of increased speculation and gray-market capital. Additionally, Jamie Dimon, of JP Morgan, stated that Bitcoin is a fraud and that it would “blow up” (http://www.msn.com/en-my/news/other/bitcoin-is-a-fraud-that-will-blow-up-says-jp-morgan-boss/ar-AArR1lF). What is the truth and what should investors expect in the future? Well, here is my opinion on this topic. Bitcoin is based on the BlockChain technology architecture. I believe this architecture will continue to be explored under the basis of an open, distributed ledger method of developing opportunities. This technology improvement will likely drive advancement in other sectors of the global market as security and accountability continue to increase. Yet, the growing pains of this technology will likely continue to drive some wild moves over the next few years. It has been reported that Cryptocurrencies fell $23 Billion in value since the peak. 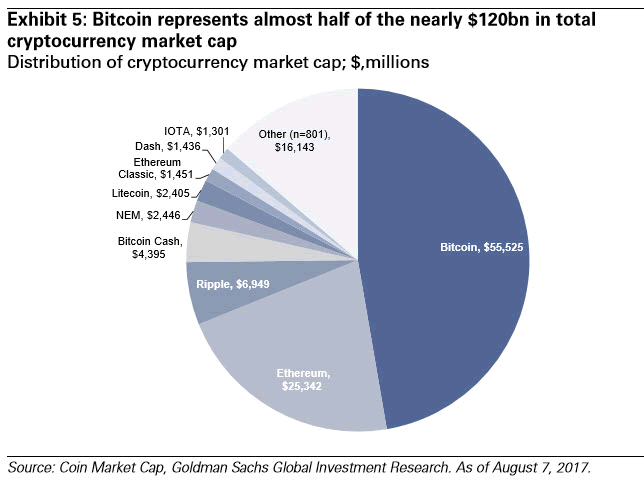 This would put the total valuation of the Crypto market at about $117 Billion near the same peak. Consider for a moment that the Bernie Madoff scandal was near $65 Billion total. Could a Cryptocurrency based “Swan Event” create chaos in the global markets? In comparison to more traditional investment instruments, the risk exposure of Cryptocurrencies seems somewhat limited. 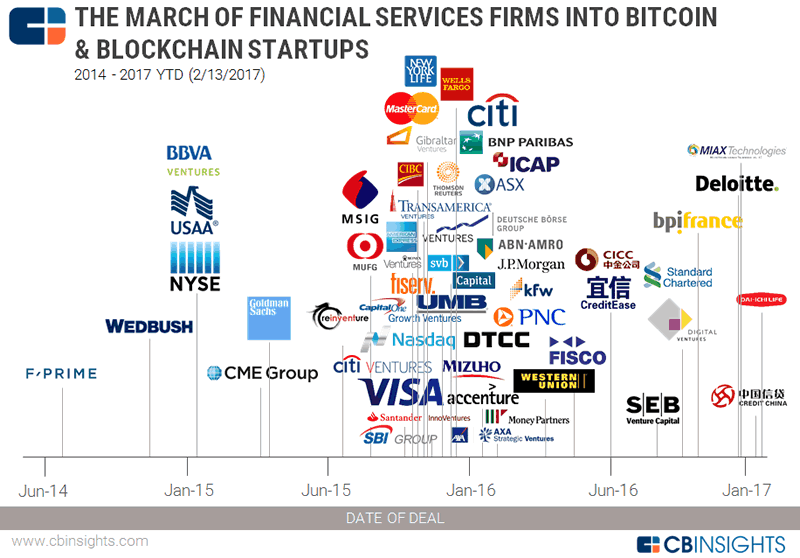 Yet consider this… Many global firms jumped onto the Blockchain bandwagon within the last 12~24 months. This is not just individual investors any longer, this is most of the global financial market. So, now our “SwanEvent” has a bit of depth in terms of risk exposure and breadth in terms of global market reach. What would an extended decline in Cryptocurrency valuations do to these firms and to the confidence in the Cryptocurrency market? Could a collapse “Swan Event” drive prices back to below $1000 (USD) or further? What would the outcome of such an event be like for the global markets? 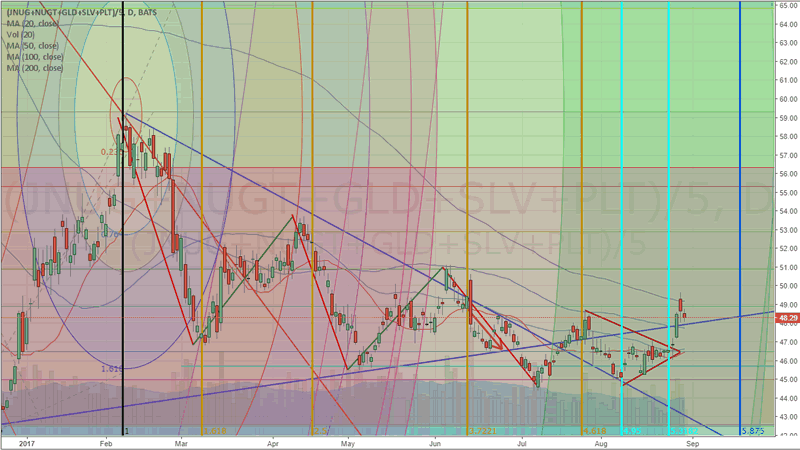 Would this type of move reflect into the global market as an advance or decline overall? And what would this mean to the bottom line of these financial firms that have invested capital, resources and client’s capital into these markets? It is our believe that the global markets are, without a Cryptocurrency event, setting up for a potentially massive corrective move. The chart, below, clearly shows what we believe to be a Head-n-Shoulders pattern forming that will likely prompt a breakdown move near October 2017 or shortly thereafter. 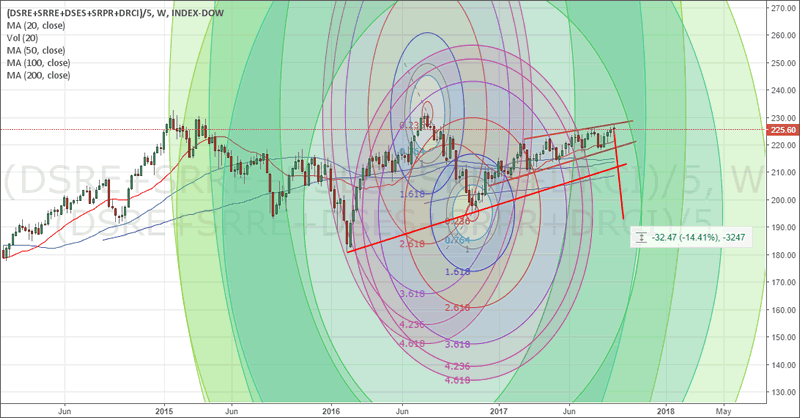 We believe this global market correction will prompt selling in weaker instruments and drive a massive “rip your face off” rally in the metals. We believe this move has already started with the formation of the Head-n-Shoulders pattern in the US markets as well as the recent upside move in the metals. The Cryptocurrency “Swan Event” may be the catalyst event that is needed to put pressure on other market instruments (US and Global equities, RealEstate, Consumer confidence/spending and Metals). Are you prepared for this move? Do you want to know what to expect and do you need help understanding these market dynamics? 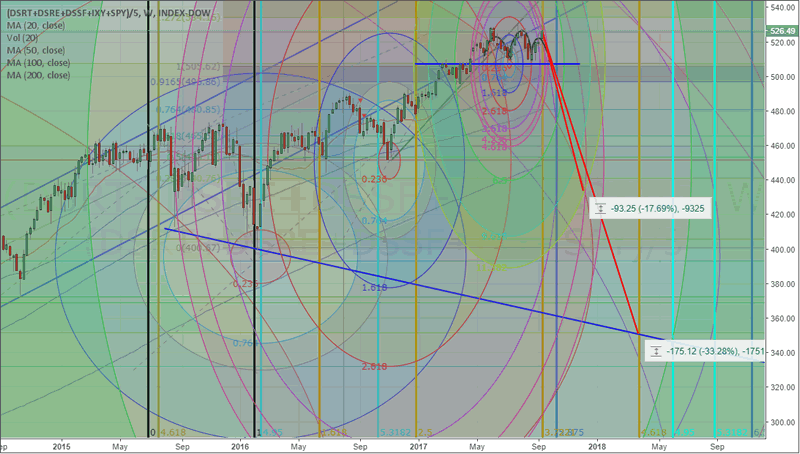 The markets are setting up for what could be one of the most explosive cycle event moves in nearly a decade and you need to be prepared. 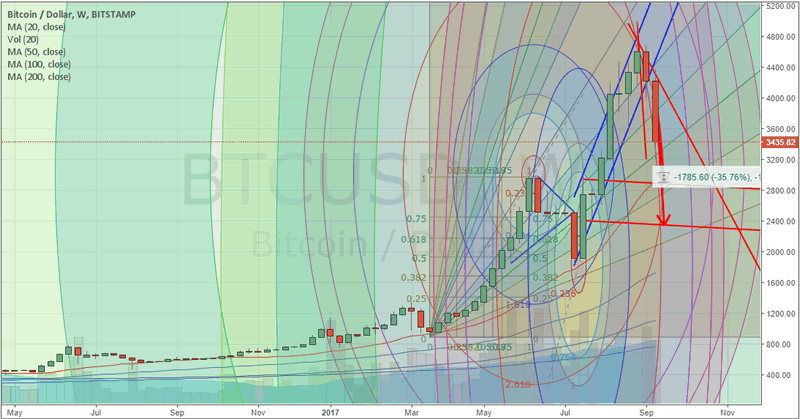 We offer our research to our clients at TheMarketTrendForecast.com for far less than you would imagine. For less than $3 per day, you can have access to our advanced research and analytics, market trend forecasts and more. We keep you informed with our timely updates and research to help you understand how these markets are moving, where to find opportunities and how to protect your investments. Our research team has over 30 years experience in the markets and have been trained by some of the best technicians that ever lived. Isn’t it time you invested in a team of dedicated market analysts that can help you protect your assets and find opportunities for an unbelievable subscription rate? When you join, we’ll send your our Guide to understanding trading PDF booklet to help you understand our advanced analysis techniques and adaptive learning strategies. These are all part of our commitment to providing you the best analysis, research and understanding of the market’s dynamics as well as making sure you understand what we are delivering to you each week. Don’t miss this next big move (“Swan Event”). Timing is everything. Visit www.TheTechnicalTraders.com to see what we are offering you.